While that may not have been the Buddha himself people saw cycling past them down North State Street this past Sunday, it may well have been the spirit of the Buddha. On bikes decorated with multicolored prayer flags flapping in the wind, 60 riders, supported by more than 20 volunteers, came together for a unique two-day event. The third annual Buddhist Bicycle Pilgrimage took them on a 150-mile spiritual journey from Spirit Rock Meditation Center in West Marin, to the City of Ten Thousand Buddhas in Talmage, and ending at Abhayagiri Monastery in Redwood Valley. Begun in 2002 by Dennis Crean, of Redwood Valley, the Buddhist Bicycle Pilgrimage was a way for Crean to combine his enthusiasm for cycling with his spiritual quest. A supporter of Abhayagiri Monastery, which drew him to the area, he was inspired to transform the ancient tradition of a walking pilgrimage into a modern-day bicycling equivalent. Since that first ride, a nonprofit organization known as Dharma Wheels Foundation has been formed to carry on the tradition. Unlike other organized bike events, this one requires no fees from participants, but rather relies on the spirit of dana, a Buddhist term for generosity, and the joyful contributions of dozens of volunteers. My own pilgrimage began only a week before the event, when I encountered three future pilgrims while cycling in the redwoods. Intrigued by the idea of such an adventure, I decided to both ride and volunteer. I found a member of my local bike club to join me in trading off cycling and "sagging," or driving a support vehicle, as it's said in cycling circles. Karen and I met for the first time at 5:30 a.m. on Saturday and consequently spent many hours of the weekend side by side, not only in my car but also in my tent. I have been on dozens of organized bike rides, and this, by far, was the best one ever. My rating scale includes food, scenery and the friendliness factor. The food was out of this world! Traveling pit stops were never without snacks and beverages, including all sorts of tempting goodies like Tootsie Rolls and peppermint patties, all donated by riders and supporters. Volunteer chefs Amy and Jim cooked up a feast for Saturday's dinner and Sunday's breakfast at the KOA campground, turbocharging all the weary riders' glutes above and beyond any of my expectations. The second factor is scenery. One rider put it so well: "Where else can you get such a variety of scenic landscapes from the pastures of Marin to the Bohemian vineyards of Sonoma to the redwoods of Mendocino?" Truly stunning, and from what I gathered from veteran participants, the temperature this year was much more forgiving than last year's 100-plus degrees. I rode the second half of Saturday and the first half of Sunday, bearing witness to both the late afternoon sun glistening off the multicolored grapevines as well as the early morning fog unveiling the sleepy awakenings along the crooked rural roads. In terms of the friendliness factor, the ratio of "hammerheads" (those cyclists who ride so fast they don't see the road upon which they travel) to Sunday-afternoon cyclists was at a desirable quotient for this rider. And the incredible slew of volunteers truly raised the kindness level to an all-time high with their warm and gracious encouragement at every pit stop. Karen was thrilled when Dave, a veteran cyclist with more than 30,000 miles logged on two wheels, took the time to slow down to chat rather than rush to beat some invisible clock. Perhaps it was the spirit of the pilgrimage, the simple but profound words of the monks lingering in the back of the mind, or the bucolic scenery and divine weather that created such a spirit of camaraderie. Reverend Heng Sure of the City of Ten Thousand Buddhas, where we were treated to lunch on day two of our journey, said it quite eloquently: "The experience of the pilgrimage is in the doing. It's the cattle guards, the fences, the uphill, the downhill, the trees." And then, as he muffled the sounds of huffing and puffing into the microphone, we all laughed at the image conjured up; the sheer grit and suffering visible in the breath, as we "go, go, go, mile after mile after mile. Is it emptiness in between? Not really. It is a fullness." The weekend seemed to be a web of connections between people and places. I met Melissa as we were climbing up a hill together. A Redwood Valley native, she had come on this ride with her sister, Cindy; her brother-in-law, Jim; and her nephew, Trevor, a seventh-grader at the local Waldorf School. Later that day, I met Trevor in person. Standing tall and wide at 5' 10", he wears braces and rides a mountain bike: "I ride wherever my parents drag me along." Another father-and-son duo were on this pilgrimage as well. Tim, a three-year veteran of the Dharma Wheels ride, is now planning a longer bicycle pilgrimage in India with his son. They plan to go where the spirit of dana will take them: no itinerary and no direction. He came across this local pilgrimage through a random Google search three years ago. The Buddhist Way is to allow others to find their own way. Many joined this pilgrimage for the physical challenge, some for the unique combination of cycling and a spiritual quest, and others for the spirit of community and to make new friends. For myself, I made new friends with many compassionate, caring and thoughtful people; cycled more miles than my out-of-shape body was used to; ate a few too many pieces of homemade gingerbread; learned a thing or two about Buddhism (such as the fact that Northern California is home to the largest number of Buddhist traditions of any region or country in the world); and took my cycling to a higher meditative level. Would I do it again? Absolutely. If life is a long road, some days are smooth and easy, a winding descent with a cool breeze at your back. Everything's rosy. Conversely, there are days like last weekend, when Alden Mudge dismounted his Lemonde racing bike and quietly said, "I feel like soggy tuna." 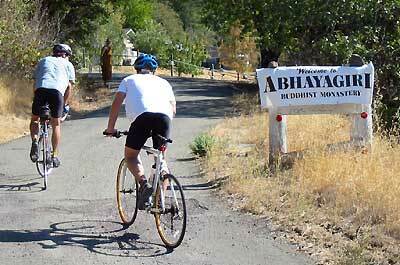 Riding a bicycle 150 miles from Spirit Rock Meditation Center in Marin County to Abhayagiri Monastery in Redwood Valley was no easy feat for Alden or for any of the seventy-five cyclists who braved the hundred degree heat for the second annual Buddhist Bicycle Pilgrimage. Bicycles broke down. Riders suffered dehydration and disorientation. And yet throughout it all, a sense of calm and goodwill prevailed. Jennifer Holmes, a veteran of many weeklong California AIDS rides, volunteered to drive a van through the backroads of Sonoma County, picking up those who where too tired to continue or beset with mechanical problems. "It's hard to ride a hundred miles in 100-degree heat," she said, circling back to make sure the cyclists at the back of the pack were hydrated and safe. And yet, because the ride was taking place under the rubric of a Buddhist pilgrimage, Holmes said, "surrendering your physical self to your mind is the real goal here." Perhaps that's why the participants kept pedaling, as road tar melted, innertubes popped and gears groaned. At the beginning of the ride, Ajahn Amaro, co-abbot of Abhayagiri Monastery, blessed the riders with chants and a few quick cycling puns. The riders departed from Spirit Rock Center on their "fellowship of the rims" and headed into the dawn's light. The weather was cool and the skies were clear. Everything was rosy. At the first checkpoint, south of Petaluma, cyclists shed layers, grabbed energy bars for the road and headed north. For this rider, the ride's first challenge came on the ascent of Wilson Hill Road. I was overgeared, and the hill was steep. On the descent, I had my first flat. In the next day and half, I would have four more. Soon enough, it was noon, and the sun's heat began to take its toll. Riding a bicycle 150 miles is no easy feat for a novice. Ride participant Rik Center said, "I never in my life thought I'd be doing anything like this." Rik had the look in his eyes of someone who's amazed, not only of the world around them, but of their own strength. He'd pedaled the whole way on a borrowed bike. Franklyn Wu, who broke his arm in a fall while training for the ride, shifted roles to volunteer his time in a support van. "It opens my eyes," he said, gesturing with his cast. "I've never seen the other side of this ride." Franklyn went to high school at the City of 10,000 Buddhas in Talmage, where the riders stopped for lunch and a tour on the second day. Visits to the local Buddhist monasteries and cultivating the spirit of a pilgrimage were integral to this unique event. Corry Wagner, this year's organizer, cultivated the group's sense of community as she pulled the event together. "I said, 'I think I can do this, but I need your help,' and there was a crew of people who said yes." Corry and her organizing committee formed a nonprofit called Dharma Wheels. Food was donated, a Web site was launched, and volunteers signed up. Piece by piece, the ride began to take shape. "Everyone pitched in," Corry said. 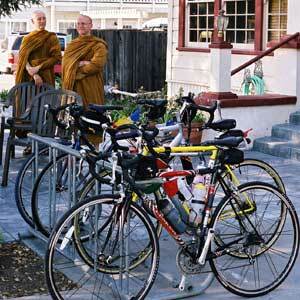 "It's our cycling sangha." The concept of sangha, or community, is fundamental to Buddhism. And throughout the weekend, someone was always there to lend a hand. Volunteers were stationed every twelve to twenty miles with food, refreshments and good cheer. Riders would pull in to these pit stops looking dazed, and they'd leave a few minutes later looking dazzled. After cycling the second day's distance of fifty miles from Cloverdale to Redwood Valley--through vineyards and a temperature of 104 degrees--Ajahn Amaro reminded the riders that there isn't a hill in the world that's so steep and long that it never ends. There's always a crest. There's always a winding descent with a cool breeze at your back. Like life, cycling "can't be downhill the whole way; it can't be beautiful the whole way." The cool breeze never materialized, but on the road home (in the comfort of a car) the effect of the pilgrimage was clear. We'd all achieved something personal: Rik had ridden farther than ever, I'd battled five flats, and our riding partner Cody, a San Francisco physician, had persevered on the ride's steepest climb. Most significantly, the pilgrimage had changed us, as Ajahn Amaro said, "to see the transient, translucent, cyclical nature of things."